An early breakfast (7 AM is early when you're on a cruise) and we were soon on our way to meet our guide for our walking tour. We went through a similar process of showing passports and bags scanned but they seemed a little more laid back that morning. Our Enrichment Lecturer, Sandy Cares, had said that the women security personnel had an unusual uniform. She was right. They were in a tight and very short khaki skirt with either black fishnet or lacy patterned hose. Still, they pulled off a professional, all business, demeanor as they checked us through. We met below the terminal again but this time we didn't board buses. I was so happy to not be on a bus. Now I could take pictures without worrying about the tinted window, reflections, and movement. Once we were all assembled, our guide introduced herself and we started out crossing the four lane boulevard in front of the terminal with the help of a traffic control person. 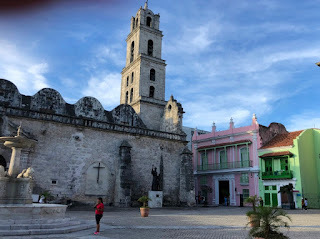 Right across from the cruise/ferry terminal is the Plaza de San Francisco. Of course every plaza was to have a church and this was named for the church that sat at one end. Our guide took time to caution us about the people we would encounter on our walk. There would be vendors and people who were dressed up wanting a CUC ($1 USD) for a picture of them. Others might be making sketches of us and then offering the sketches to us for payment. As she spoke, a man in a clown costume with a small dog sitting on top of his head approached us. She greeted him with a smile and said something in Spanish. He smiled back and moved away a bit. This would be repeated several times throughout our tour, twice when she embraced the vendors and apparently asked them to give us some room. I have never seen such kindness in a tour guide toward those who are trying to sell things to tour groups. Also, I've never seen people who are desperate to sell what they have to offer actually give space to the tour group. We never felt haggled or unsafe or bothered even when it was someone just begging which didn't happen nearly as much as I thought it might. 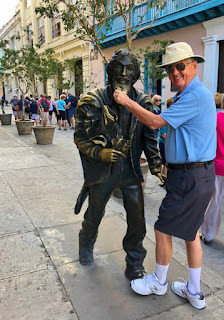 We wandered around the San Francisco plaza a bit and of course took a picture with "El Caballero de Paris" Jose Maria Lopez Liedin. There are all sorts of stories about him but the one that seems to emerge the most is that he was a dreamer who wandered the streets sharing dreams and stories with anyone who would listen. It is said that if you touch the beard, hand and shoe of the bronze statue your dreams will come true. They are obviously the shiniest parts of the bronze. There were several dogs roaming around and sometimes coming up to us in a friendly approach. We noticed that a few had a collar with a white tag attached. Our guide explained that these were actually employed by the historical department. Sort of good-will ambassadors. People were asked to love them and feed them. She didn't explain what happened to the ones without a tag. 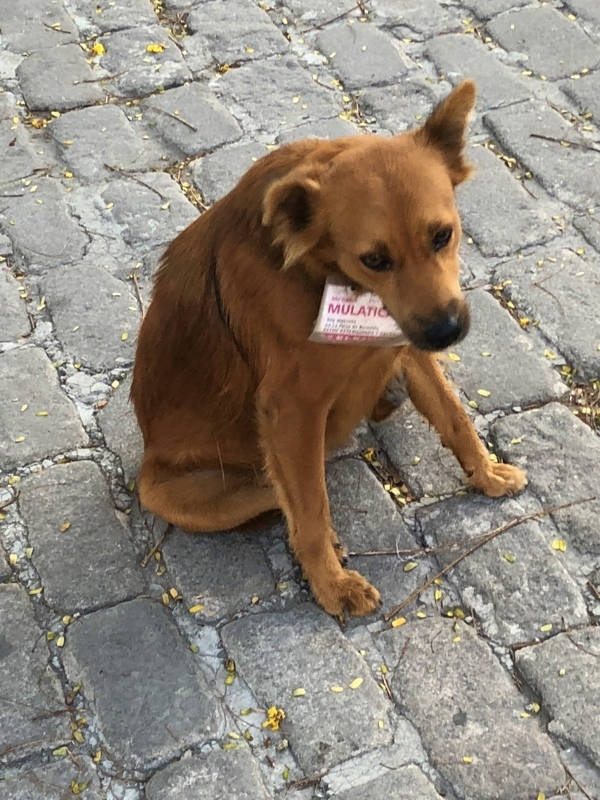 A little research showed me that there is a movement underway in Havana to neuter strays and vaccinate them and encourage people to adopt them. Here's a link to the story I found. The only traffic in the Old Town area consisted of a few trucks where there was some restoration work going on. The rest of the time it was all pedestrian and made for a comfortable walk as we moved on to the next plaza.